Singh Movers - the leading Removalists Ferntree Gully. Are you a resident of a suburb- Ferntree Gully of the city Melbourne? Are you a new resident in this suburb or the old one? It does not matter enough as either you are an old or a new resident, we are always available in your service. 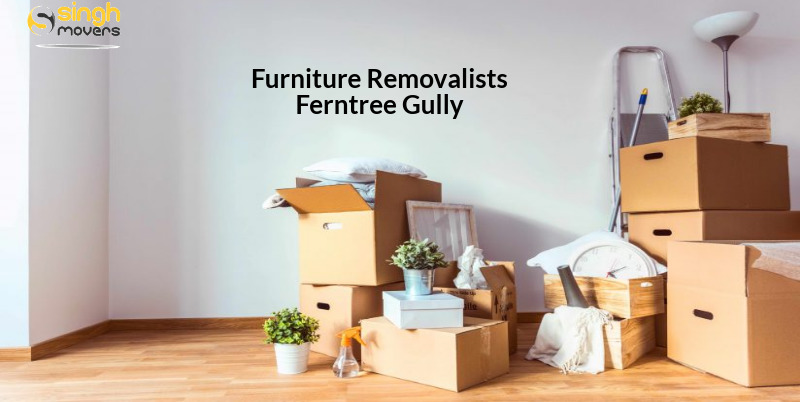 We are a one stop solution for all the services and are well-known as one of the famous FURNITURE REMOVALISTS FERNTREE GULLY. However, there are many other Movers And Packers company available in this suburb of Melbourne but we will offer you the services at affordable rates at only one stop. Removalists Melbourne will take care of all your possessions in the best possible way of making the move from tiring and stressful to the most relaxing one. It does not actually matter that you are moving locally or interstate, we will help you in both cases. Helping many Australian clients with their success stories is our main targeted aim. Singh Movers promise the quality Furniture Removalists Ferntree Gully service at low-cost prices to our clients of Ferntree gully suburb of Melbourne. Our employees are fit and well-trained in the field of Furniture Movers. Singh Movers is a Melbourne based company assisting the clients round the clock with their doubts and queries. No matter what problems the customers have, we are available to solve it for you. We are the major furniture movers that you can trust and rent for your home, office or industrial steps. We have a feast of experiences in this furniture movers area. We end up with full service including packing, wrapping, shifting or unloading. You can book your assignation with us by a call, mail or an online appointment. Once you confirm the booking, our team members along with the manager will pay a visit to your place and analyse the things thoroughly. Our team believes in working properly to analyze and analyze the materials to be transferred. A fully detailed checklist is created from a file to the dining tables and chairs, with a full detailed explanation of the special material. After you allow us to do the work, we do it all by ourselves as we decide everything with our client before we start the work. We start by transferring small items into the whole house or office or industrial moves. We are known for the timely Furniture Delivery Melbourne. We make the customer stress free and enjoy snacks with members of his family and we do all the work within the time limit provided to the members of the Singh Movers - Movers and Packers Melbourne team. Our Friendly Moving Men ensure the safety of all of your stuff because of their professional experience in this particular field. We transport your items to your desired location safely and securely. Furniture Removalists Ferntree, Movers And Packers Offer? No Depot To Depot Charges: You will never be asked for any depot to depot charges as it is only our team who will reach you and why we will ask you to pay for that. Door To Door Charges Only: We will only charge you for Door to Door Shifting when the main process will start. No Fuel Charges: SINGH MOVERS will never ask their clients to pay any type of fuel charges as Affordable Furniture Removalists will endow you with every facility that we can and will not charge you for any type of extra stuff. Professional Tools: Furniture Movers of Singh Movers And Packers Company treat their every customer as their family and complete their work with proper safety and using different types of professional tools. Singh Movers also have professional trolleys and ramps for the shifting of various types of upright pianos. 24*7 Support: We will solve your every problem. You can call or mail us at any time you want to as we are available round the clock for our client’s assistance. No Hidden Charges: Singh Movers have shown all their charges beforehand to their customer in their company’s quote. We do not ask you for any other charge for the sake of money. We just believe in providing quality work as we work for the success of this company and for the happiness of our clients. Why You Should Count On Us? Singh Movers and Packers Melbourne is considered by many Ferntree residents for their quality service at an affordable price. We endow our customers all the facilities at the affordable prices possible. It is our company’s main motive to offer their customers with all the services at low-cost so that the prices won’t lay heavy on any type of customer’s pocket. Now, this is a major doubt in every customer’s mind as many other service providers promise always to shift the stuff on time but do not actually do so. But why choose Singh Movers? Because Singh Movers is an on-time delivery company and do not let their customers disappoint in any case. Our timely delivery will always make you smile. Singh Movers can always be fully trusted for the safety of the stuff as they properly plan, pack, and unpack the stuff using professional tools and by undertaking the proper safety measures. Have full faith in us and call us to hire for the quality services. We along with furniture removal endow many other facilities like office moving, moving interstate whether an office or a house, storage facilities etc. Singh Movers is a company of Movers And Packers Melbourne at whom you can rely upon for all types of removals work. You need not to worry at any point of the shifting process. We are fully insured removals in Melbourne and its suburbs. Though we and our professional team never let any problem happen during the shifting process if sometimes it happens for the materials in transit, we pay up to $100,000. On the other side, in case of any harm to the public, we pay for the public liability around $10,000,000. We offer our clients with one more important service- STORAGE FACILITY at the SINGH MOVERS Company. So, if for the time being, you do not want to shift all of your goods to your house, office or industry, we have plenty of space for your belongings to be stored under CCTV SURVEILLANCE for 24*7. In order to acquire the quality services, contact SINGH MOVERS and be ready to just chill with your family in the best possible way. Ferntree Gully is a suburb of Melbourne, Victoria, Australia which is at the foothills of the well known Dandenong Ranges which is 32 km east of the Melbourne’s Business District- located within the City of Knox local government area. The population of the suburb Ferntree Gully is 26,428 according to the 2016 census. The suburb is located on the Belgrave railway line. Ferntree Gully is known mostly for its gum trees known as Eucalyptus. Ferntree gully suburb is in the high fire risk precinct in the vicinity of the National park of Ferntree Gully. On the other side, the majority of the suburb is considered at low risk. With our quality services, you will be pleased with every point of the process. One hand is yours and the second hand is ours. Together we make the best out of every service. You just need to trust us and we will pay the worth of your trust endowing you with the amazing services. We are the affordable and secure storage solution that comes your way. Your work will be done with the optimum ease and long with the proper safety undertaken. Our Friendly moving Men have a feast of experience in this Furniture Removals service which will make your move the stress-free, hassle-free and will deliver your treasures securely to your desired place whether locally or interstate. Singh Movers will not disappoint with its work in any case and you will be happy later with the service provided by us. Ask our customer care executives if you have any doubts, have a talk with our experts, set your mind, and feel free to hire us for the fabulous services. Move with Us for Easy,Affordable,Quality Removalists Services Australia Wide. Contact Us For Free Enquiry and to Arrange a Free Obligation quote. For more information on furniture removals and Storage Services don�t hesitate to get in touch to one of the Expert Team Members or representatives on 13000SINGH OR 1300074644 for a free obligation quote from the Singh Movers Team, simply fill out our quick quote form or write an email or call us directly as per your convenience. Our Head office is located in Melbourne and Singh Mover's offices are spread across over other major cities: Sydney, Adelaide, Brisbane, Canberra, and Perth. It�s useful to keep a notebook at hand to write down reminders. Pack a suitcase with clothes and toiletries like you�re going on a trip for a few days. "They are the best people in the town for moving." "Used their service multiple times and had great experience." "I have moved a lot over the years and had many bad experiences. singh Movers were on time, efficient and professional. There was no damage to my furniture, the team were friendly, considerate and overall a pleasure to deal with."